Nabila Ramdani is an award-winning journalist, broadcaster and academic who has studied and taught at the universities of Oxford, Paris VII, Michigan and the London School of Economics. Her qualifications include an MPhil in History and an Agrégation, the most selective, competitive teaching examination in France. Nabila regularly lectures at schools and universities around the world, while also writing for a wide-range of publications, from the Guardian and Independent to the Daily Telegraph and Sunday Times. 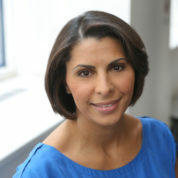 She contributes to numerous major TV and radio outlets, including the BBC, Al Jazeera and Sky News. Nabila started her career as a political commentator covering the 2007 French presidential election in her home city of Paris. "Education is the key to a happy, fulfilled life, and also vital in the fight against all forms of injustice. This is what makes organisations like the Varkey Foundation so incredibly important"